According to recent UN reports*,** 55% of the world’s population lives in urban areas in 2018 and one in eight people live in one of 33 megacities each with more than 10 million inhabitants. By 2050, 58% of the global population will live in hyper-dense urban areas, resulting in greater energy consumption, more waste, and more traffic congestion which will adversely affect air quality and increase the pollution levels of cities. As urban air quality declines the risk of stroke, heart disease, lung cancer, and chronic and acute respiratory diseases, including asthma, increases for the people who live in these hyper-dense areas. Air mass flows in megacities are highly dynamic, often forming invisible shifting pollution hotspots. Time and space differences, such as traffic rush hours and street canyons cause significant heterogeneity in chemical composition of air masses. By leveraging a socially meaningful air quality information system with high-density, high-accuracy, near-real-time data, municipalities can use this information to help make pollution mitigation decisions, change traffic plans and announce preventive public alerts. An approach for gathering accurate air pollution information can use end user applications in handheld or wearable devices and navigation systems. With this valuable information, quality of life improvements can be made such as when to plan sporting or other outdoor activities or routing traffic to lesser polluted areas. Efficiencies in mitigating air pollution can also be realized as connected air purifier systems receiving highly accurate pollution data can save vast amount of energy working always at the optimal load. Recent monitoring systems using a limited number of highly accurate measurement stations are not sufficient to create the needed citywide air quality index. To provide higher accuracy at the same time as low cost, a massive volume of costly sensors would be necessary. This is currently an open challenge as low cost sensors are not yet able to provide the expected accuracy level. 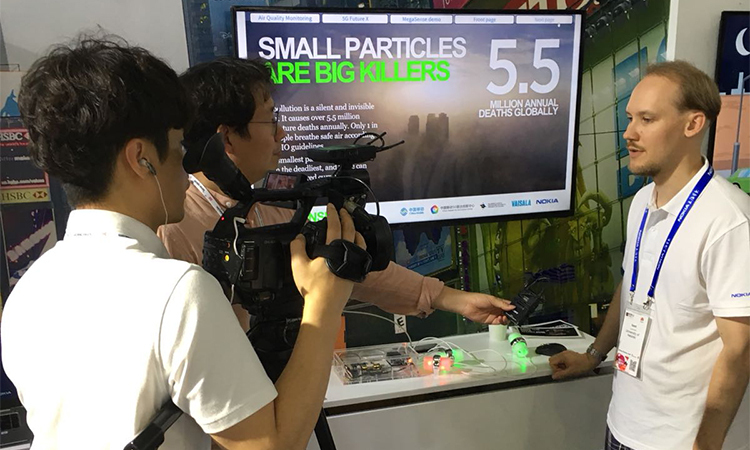 At the MWC-Shanghai 2018 China Mobile Innovation Center, China Mobile, in cooperation with University of Helsinki, University Beijing and Nokia, demonstrated a groundbreaking concept on how to use limited number of high accuracy measurement equipment along with a massive number of low-quality and low-cost sensors stations to extract the needed air quality detail accuracy. The demonstration showed how in the age of massive-machine type communication (mMTC), a megacity environment in the near future will have a sensor approximately every 10 meters: connected fixed sensors will be working in street and traffic lights, air purifier systems will be installed in smart buildings, in vehicles and consumer devices like smartphones and wearables will have sensors included. 5G enables sensing on a scale that would be prohibitive using other technologies, and the huge amount of data and insights collected will enable network operators long-term value creation that will boost the ecosystems of new smart city and end-consumer services driven by real use-case scenarios opening up several new business opportunities. These new services will have hugely positive impact to the environment, society and individuals by reduced traffic and congestion, optimized energy consumption, improved air quality, decreased air-pollution caused morbidity and providing timely and personalized information for citizens. And the upcoming 5G standard releases are enabling mMTC, such that handling huge number of low energy consumption sensors can be served by 5G capabilities to support new services and new vertical application domains. The Nokia 5G FutureX architecture provides foundation for massive scale air quality sensing by supporting energy efficient wireless connection, high-resolution sensor positioning, high bandwidth communications as well as localized data processing and analytics through mobile edge computing. 5G will offer the benefit of scale, using network slicing to optimize the connectivity of sensors. Distributed sensing can be deployed intelligently according to different needs. Learn more how 5G is able to serve high dense sensor connectivity and large scale sensing from the joint Solution Brief, share your thoughts on this topic by joining the Twitter discussion with @nokia and @nokianetworks using #5G, #IoT, #Slicing, #NetworkSlicing. Read more about the technology, use cases and solution on the Nokia 5G website. Tamás works in Nokia’s 5G marketing team responsible for AirScale – the company’s latest cutting edge 5G radio access solution. He’s addicted to the electromagnetic spectrum beyond cm and mmWaves – and spends his free time capturing images of objects in the solar system and beyond.